The science Skeptics are quite adept at casting doubt on climate science by using clever arguments. One of their favorites is “How can science claim man is the cause of global warming when the temperature of the Earth was much warmer in the last millennium during the Medieval Warm Period (MWP)?” You don’t really have to be a scientist to figure out that there were no accurate temperature records during the Medieval times and that much of the world was unknown. The Skeptics usually point to historical records such as those by H.H. Lamb, which describe record heat waves in the known world during the MWP. Skeptics rather ignore the fact that H.H. Lamb was so concerned about the effect of global warming that he founded the Climate Research Unit (CRU) to study the Earth’s temperature records. The scientific questions comes down to (1) whether the MWP was worldwide, (2) how warm the Earth actually was during the MWP, and (3) what caused the MWP? Though there are wide uncertainties in the proxy temperature records, taken together they form an overall pattern which answers the scientific questions. 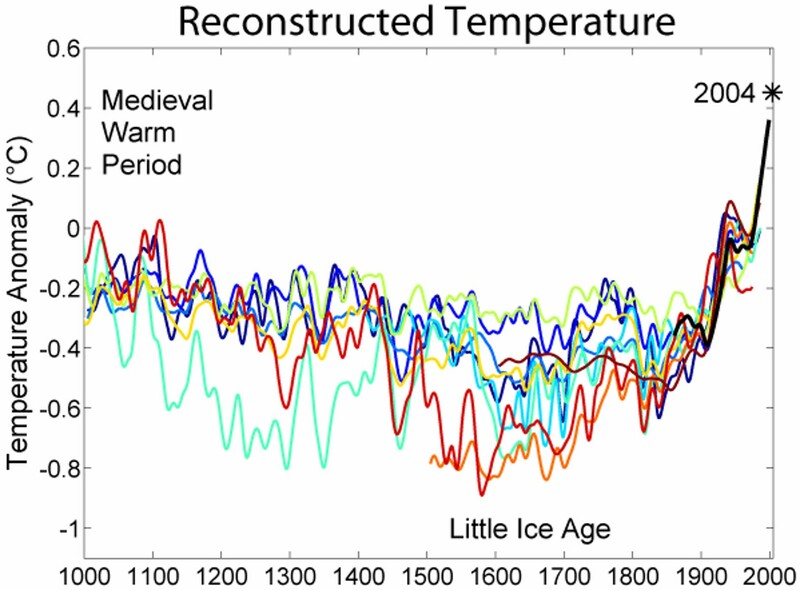 The proxy records show that that (1) there was a warm period from AD 1000 to 1200, followed by a cooler period from AD 1550 to1850 NASA identifies as the Little Ice Age, though it was not a true Ice Age. The record also show that (2) temperatures during the MWP were quantitatively lower than the temperatures during the latter 20th century. To discover the cause of the MWP, it is necessary to look at another reconstruction. While studying the cause of the past Ice Ages, scientists have identified the three main factors which affect the Earth’s temperature, solar irradiance, greenhouse gases (primarily H2O and CO2), and particulates from volcanic activity. Below is a reconstruction of the three main factors controlling the Earth’s temperature. There are many interesting things in the records, but they show (3) the Earth was likely warmer worldwide during the MWP because of the higher solar radiation. 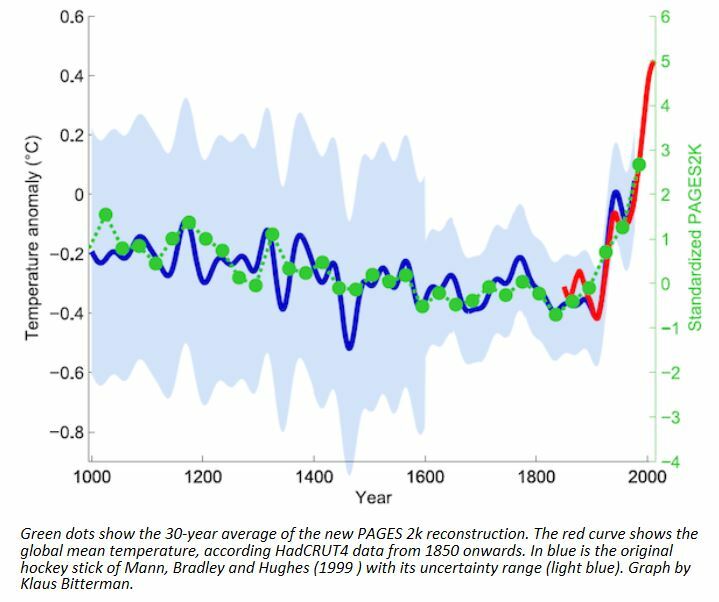 It also shows that the solar radiation has been relatively constant during the last century while the other factors, primarily greenhouse gases, have increased. While it is possible to dispute or argue about the meaning of any of the individual records, it is rather disingenuous to claim that scientists “ have no data” or to dispute the obvious causes of the current global warming. To emphasize that, below is data from the last century, which is based on scientific records. While H20 and clouds accounts for about 75% of the greenhouse warming, their effect has increased only slightly( about 4%) while the amount of carbon dioxide has increased by about 39% in the last century. Temperature: CO2 is one of the greenhouse gases that warm the Earth, and NASA’s graph shows how its increase is changing the Earth’s temperature. Note: The effect of particulates from the explosion of Pinaturbo can be seen in the temperature decline from 1991 to 1995. The Sun: The current global warming is often wrongly attributed to an increase in intensity of the sun. The sunspot activity does not show up above the noise in the temperature record above. 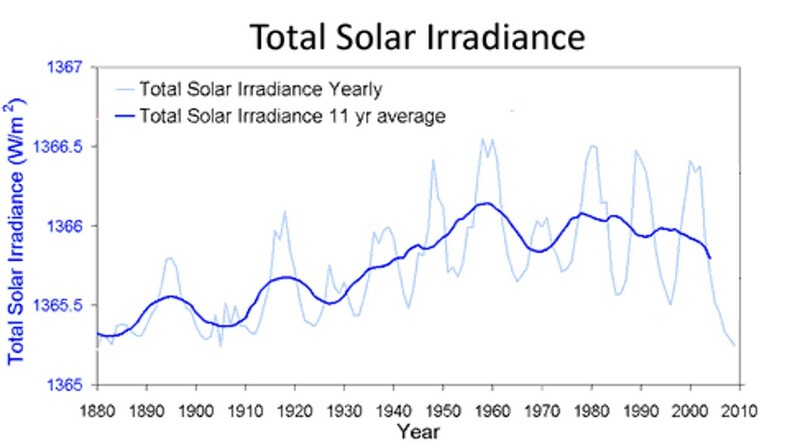 The solar irradiance increased slightly until 1960 and has declined slightly since then. (blue 1000-1980): M.E. Mann, R.S. Bradley, and M.K. Hughes (1999). “Northern Hemisphere Temperatures During the Past Millennium: Inferences, Uncertainties, and Limitations”. Geophysical Research Letters 26 (6): 759-762. (lightest blue 1402-1960): K.R. Briffa, T.J. Osborn, F.H. Schweingruber, I.C. Harris, P.D. Jones, S.G. Shiyatov, S.G. and E.A. Vaganov (2001). “Low-frequency temperature variations from a northern tree-ring density network”. J. Geophys. Res. 106: 2929-2941. (light turquoise 831-1992): J. Esper, E.R. Cook, and F.H. Schweingruber (2002). “Low-Frequency Signals in Long Tree-Ring Chronologies for Reconstructing Past Temperature Variability”. Science 295 (5563): 2250-2253. doi:10.1126/science.1066208. (green 200-1980): M.E. Mann and P.D. Jones (2003). “Global Surface Temperatures over the Past Two Millennia”. Geophysical Research Letters 30 (15): 1820. doi:10.1029/2003GL017814. (black 1856-2004): Instrumental data was jointly compiled by the w:Climatic Research Unit and the UK Meteorological Office Hadley Centre. Global Annual Average data set TaveGL2v  was used. This entry was posted on Sunday, April 1st, 2012 at 12:42 pm	and is filed under Global Warming. You can follow any responses to this entry through the RSS 2.0 feed. You can leave a response, or trackback from your own site. Hi there friends, pleasant post and good urging commented here, I am genuinely enjoying these. I have read so many articles or reviews concerning the blogger lovers but this paragraph is in fact a good piece of writing, keep it up.